Candlemas is a Christian holiday commemorating the presentation of Jesus at the Temple. 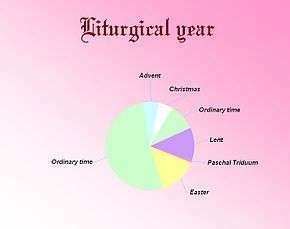 It falls on February 2, which is the 40th day of the Christmas/Epiphany period. The Feast of the Presentation is one of the oldest feasts of the Christian church, celebrated since the 4th century AD in Jerusalem. There are sermons on the Feast by the bishops Methodius of Patara (died 312), Cyril of Jerusalem (died 360), Gregory the Theologian (died 389), Amphilochius of Iconium (died 394), Gregory of Nyssa (died 400), and John Chrysostom (died 407). It is also mentioned in the pilgrimage of Egeria (381 - 384), where she confirmed that the celebrations took place in honor of the presentation of Jesus at the Temple. Christmas was, in the West, celebrated on December 25 since, at least, the year AD 354 when it was fixed by Pope Liberius. Forty days after that was automatically February 2. In the Eastern parts of the Roman Empire, Roman consul Justin established the celebration of the Hypapante on February 2, AD 521. Pope Gelasius I (492–496) contributed to the spread of the celebration, but clearly did not invent it. Moreover, the link made by Cardinal Baronius between the presentation of Jesus and Lupercalia is probably inaccurate since Lupercalia was not celebrated in Jerusalem and it was only there that one finds some celebrations of the presentation of Jesus around this date. But it appears that it became important around the time of the Plague of Justinian in 541, before slowly spreading West. The ancient Romans celebrated the Lupercalia in mid-February, in honor of Lupercus, the god of fertility and shepherds. The celebration of Feralia occurred at the same time. The Lupercalia have frequently been linked to the presentation of Jesus at the temple, particularly by Cardinal Cesare Baronio in the 16th century especially because of the theme of purification that the two festivals share. In fact, Pope Gelasius I had much earlier written a letter to a senator Andromachus, who wanted to reestablish the Lupercalia for the purpose of purification, and the so-called Gelasian Sacramentary mentions the celebration of the Presentation of Jesus, lending support to the conclusion that Gelasius substituted the pagan festival with a Christian one. However the Gelasian Sacramentary shows a strong Gallican influence and was actually compiled between AD 628 and AD 731, so it is possible that the addition of the celebration was not due to Pope Gelasius at all. Moreover, when Gelasius addressed Andromachus, he did not try to use his authority, but contented himself to arguing for example that the Lupercalia would no longer have the effect it once had and was incompatible with Christian ideals. This could be interpreted as evidence that he had limited influence on the Roman aristocracy. 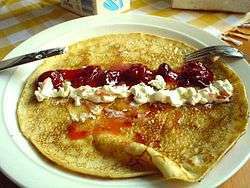 The custom of making pancakes (see below) is similar to the custom of the Vestal Virgins during Lupercalia, offering cakes made with wheat from the old crop so that the following crop would be good. Among the Celts, the pagan celebration of Imbolc occurred on the first of February. This was in honor of the goddess Brigid and was associated with purification and fertility at the end of winter. Peasants would carry torches and cross the fields in procession, praying to the goddess to purify the ground before planting. Crêpes with their round form and their golden color are reminiscent of the sun, an appropriate symbol during Candlemas, as this is the time of the year when the days get longer. It is also the time of year when the winter seeds begin to grow. The people therefore used left-over flour to make these crêpes, symbolizing prosperity for the coming year. The celebration took on a Marian character after the appearition of the Virgin of Candelaria on the island of Tenerife. In 1497 the conqueror of Tenerife, Alonso Fernández de Lugo, celebrated the first Candlemas dedicated to the Virgin Mary. For a long time, the Catholic Church sought to eradicate these pagan practices. To do this, it instituted the Feast of the Presentation of Jesus at the Temple which is celebrated on February 2, which corresponds to the Feast of the Purification of the Virgin Mary. However, the celebrations of the bear and the return of light continued, with bonfires and other torchlight processions. Pope Gelasius I in the fifth century therefore instituted the feast of candles. From the twelfth to the eighteenth century, Candlemas was called "chandelours" in many areas (including the Alps, Pyrenees, Ardennes) where the memory of the cult of the bear was still very present (ours meaning bear in French). Christian sovereigns and churches in Europe have sought to eradicate long persistent pagan practices. For the bear origin hypothesis to be a valid explanation would require, according to some, that it be operative in Rome in the mid-fifth century, where Christmas was fixed on December 25, and in Jerusalem, where the liturgical practice of celebrating the Presentation developed. Others claim there is no need for this hypothesis – the Christian calendar was bringing about the establishment of the feast by itself. Indeed, we see that Candlemas was fixed on the 2nd of February, and the feast of Saint Brigid on February 1st (Brigid being the name of the Celtic goddess celebrated at that date). There is also the Aosta Saint-Ours, and Saint Blaise (which means "bear"). Candlemas is also the beginning of the carnival period; the bear is the carnival animal par excellence. February takes its name from the Latin verb februare which means "purification". Christianity has therefore placed the Feast of the Purification of the Virgin at this time. The purification in question is the departure of the "winter darkness". The myths of Sleeping Beauty or Theseus and Ariadne (for example) relate to the release or liberation of the light (Dawn of the year) by the "solar knight". Chandeleur, also known as crêpes day. Candlemas is celebrated in the churches on February 2. It is also considered as the day of crêpes. Tradition attributes this custom to Pope Gelasius I, who had pancakes distributed to pilgrims arriving in Rome, but as mentioned earlier one can also see it as a vestige of the custom of Vestal Virgins making offerings of cakes at the time of the Lupercalia. Being a descendant of an ancient torchlight procession, the current tradition of Liichtmëssdag is a holiday centered around children. In small groups, they roam the streets in the afternoon or evening of February 2nd, holding a lighted lantern or homemade wand, singing traditional songs at each house or store, especially "Léiwer Härgottsblieschen". In exchange for the music, they hope to receive a reward in the form of sweets or loose change (formerly bacon, peas, or biscuits). Following this is the family meal. Whoever draws the bean on Epiphany must also prepare tamales, which is believed to echo Mexico's pre-Christian past with its offerings of maize. The whole family is invited to this meal (often the same people as for the Rosca at Epiphany), which gives the festival an aspect of family and sharing. These celebrations take place not only in Mexico but also in Mexican communities around the world, for instance in France. It is for this reason that the Mexican tradition also appears in the Inventaire du patrimoine culturel immatériel en France. The celebration of Candlemas has largely been replaced in the media by Groundhog Day. ↑ (la) Barri Ducis, L.Guerin, Annales Ecclesiastici Caesaris Baroni,‎ 186, t.
↑ George E. Demacopoulos, The Invention of Peter: Apostolic Discourse and Papal Authority in Late Antiquity, University of Pennsylvania Press,‎ 2013, 74–80 p.